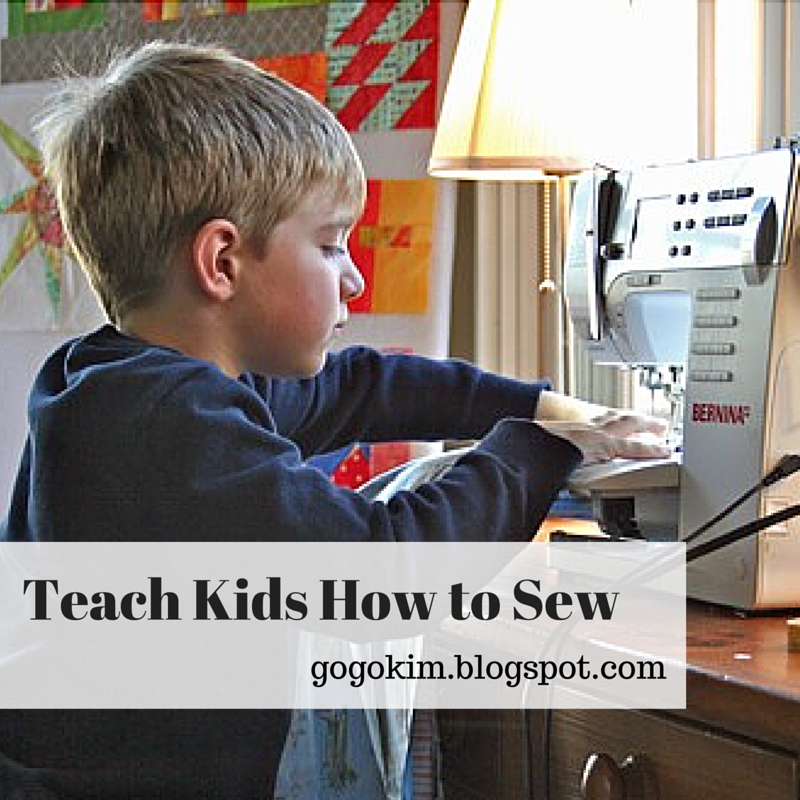 Monday Motivation: Teaching Kids How To Sew! Welcome back to Monday Motivation! Do your kids ask to sew along with you? Do you have extra little hands helping all the time but are not sure how to get them started? This week in Monday Motivation is Teaching Kids How To Sew! I have four children, three boys and one girl. The youngest is the one child that has shown the most interest in the entire process of sewing. From a very young age, he has been allowed to help me push the GO pedal and "help" me with stitching. Children are incredible in the way that they can do so much more than they can show. They take in information ( usually without us noticing) and then are able to recreate what we have shown them without missing a beat. 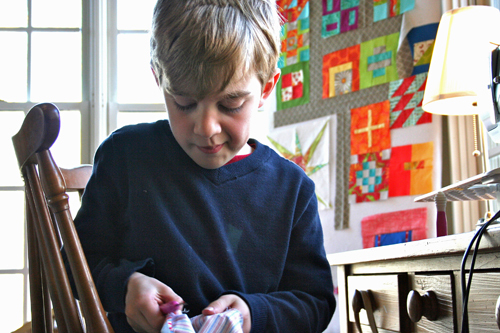 Sewing with children is one of the most rewarding gifts to give to any child. They will learn the skills of patience and attention to detail. You can show them how almost everything in their world from the bedding they sleep on, the upholstery in cars to the clothing they wear is made using sewing machines. 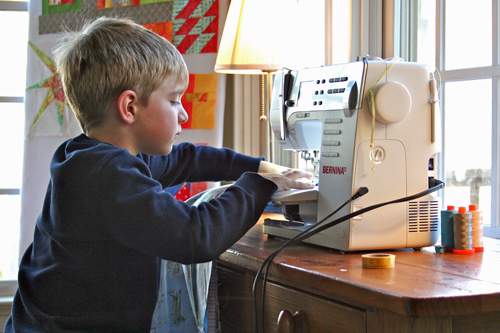 Sewing is a wonderful skill to pass on to our children! 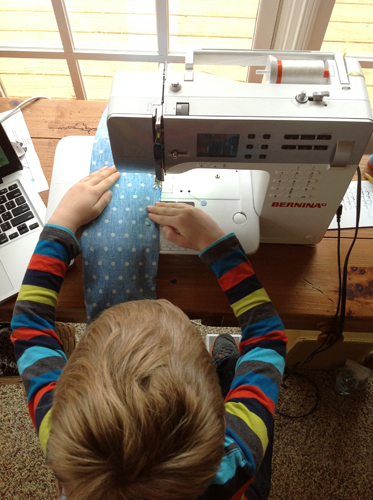 I have had the great pleasure of sewing with my own son, Adam, many times and and would like to share some of the things made it easier for him and me to enjoy our sewing experience together. Tip One: Safety is key when sewing with children. 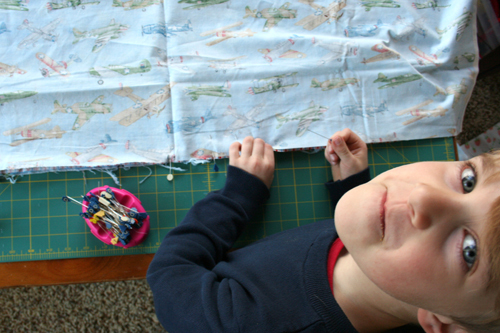 Please make certain that you do not leave any child unattended when sewing. 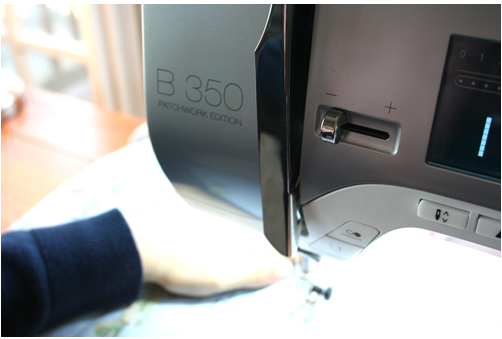 Even adults ( read this adult) with years of experience can be injured in sewing accidents; your presence will not only help keep your child safe, it will also add to the quality time you are spending with your child. Tip Two: Have your child read pattern instructions to you or read them to the child first. I found this to be very important. Adam being able to understand where he would be going next with his project took away that element of uncertainty. He was less likely to become frustrated knowing what things would be like as he went along. If you do not have a reader yet, read the directions with them explaining along the way. Tip Three: If possible, bring sewing down to the child’s level. We have done this many times. I will place a cutting board on the coffee table to bring what is normally something that is out of reach to a more comfortable level for a child. Tip Four: Let them pin. Pinning is a lesson in prep work (very important in many areas of life) and patience. Show them how to gently guide the pins into the fabric. Excellent eye hand coordination skills are always good to build for children. They will be experts in no time and possibly can help you on your next project. Tip Five: Set your speed regulator to the lowest possible setting. By setting the speed to the lowest setting there is less possibility of your child making mistakes that can cause them to be upset; it can also keep them safer. If you do not have a speed regulator on your machine, sit down with your child and show them what kind of pressure to use on the foot pedal. Adam did very well at regulating the speed with or without the regulator being turned down. 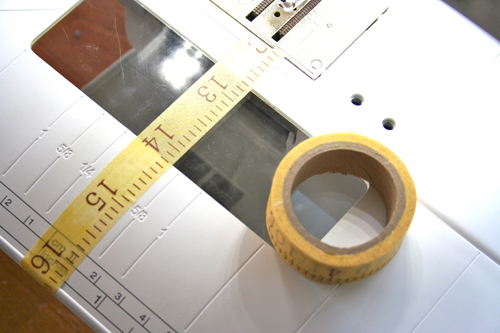 Tip Six: Use Washi tape to place a guide marker for them to follow. I found when sewing with Adam that he needed a little help with minding the seam allowance. Washi tape is very cute and leaves no reside on the machine after being taken off. You can also use painters tape. 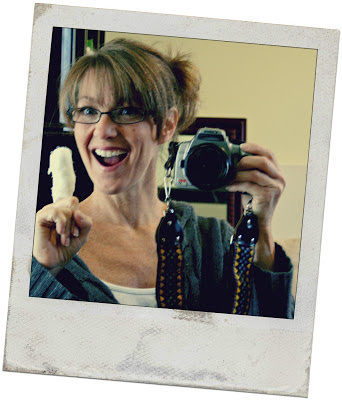 Tip Seven: Introduce the joys of seam ripping! Okay, joys may not be the right word but when he made a mistake, I asked him if he knew what to do. He knew he had to rip it out! He even knew where Jack the Seamripper was located and that Jack had a special side to “erase” all the threads. My little sponge! He was not thrilled about it at first but he was happy that he was able to undo his mistake and gleefully told me that the second time he was even faster than the first! Tip Eight: Enjoy this time with your child! Really, other than safety, this is the one area I want to place the most emphasis. 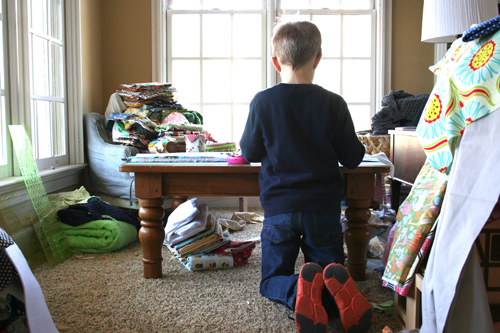 Your love of sewing can be a gift you give. Your child may not be ready to finish a full project their first time at the machine – that is perfectly okay. They may need a few tries to finish something or they just may need a little more of your help. Every time you spend that one-on-one time with them introducing a technique, they will remember at least part of it. Sewing is a skill to be built upon; give them a good foundation. 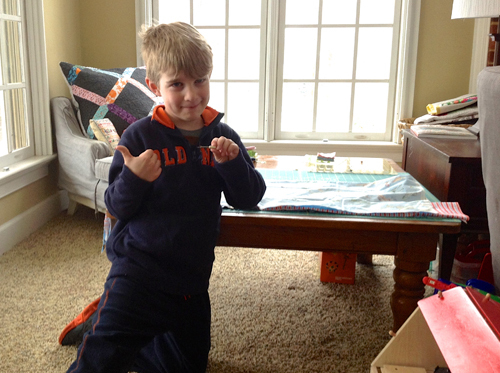 Adam did have his first finish when he sewed! 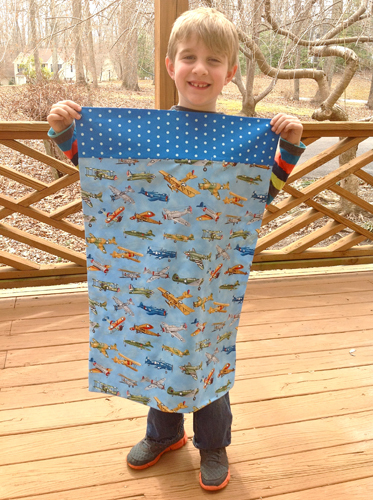 He made his beautiful pillowcase to be donated and was so very happy with his accomplishment. 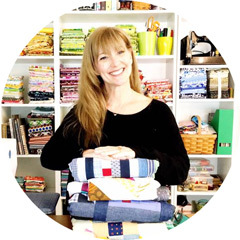 Visit All People Quilt 1 Million Pillowcase Challenge to find out more about how you can participate in a great cause! There are many FREE pillowcase patterns available for you to try different and fun techniques for this wonderful charity drive! I appreciated this! My granddaughter is just 5, but very interested in sewing, especially when her mom and I have sew day. 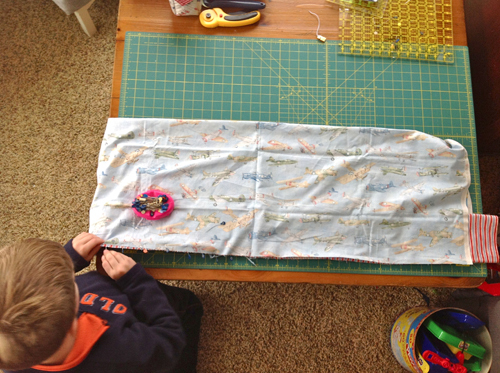 So thanks for all these tips..
Sweet that your son shows an interest in sewing and his pillow case is great! I taught my son to sew when he was about 11 ~ he altered his jeans to be skinny before they made skinny jeans and he did it for his friends too. I don't think he sews much anymore, but he knows how! And, my Dad is the one who taught me how to use the sew machine and read a pattern. Really great tips. I just did a workshop last week in my son's kindergarden class, with boys and girls of age 5 and 6 years old. They all glued some ribbons to a background piece of fabric. And then they came one at a time to the sewing machine. To have a better view on the children, I put the pedal on the desk, to use as a computer mouse. That way, I had a better view of where all these little hands were. They all loved it. I hope I inspire some of them to sew when they'll be older. Sewing machine are rare in our houses these days.